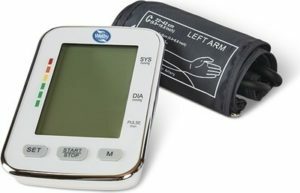 This week’s theme includes items for the bathroom as well as healthcare and mobility assistance products such as a blood pressure monitor and rollator. Welby Blood Pressure Monitor, $24.99. I deal with white coat hypertension, resulting in high blood pressure readings at doctors’ offices, so I like to take my blood pressure at home to get a more accurate reading. I bought a Welby blood pressure monitor from Aldi two years ago, and it has served me well and provided accurate readings. Welby Folding or Offset Cane, $9.99. Comes in black or blue. Welby Raised Toilet Seat or Bathtub Safety Grab Bar, $19.99. Dentiguard Rechargeable Sonic Toothbrush, $24.99. Customizable sonic modes include: standard, sensitive, whitening, and gum care. You also can buy Dentiguard 3 Pack Replacement Sonic Brush Heads for $9.99 in standard, sensitive or whitening. Read a review of the sonic toothbrush here. Easy Home Decorative Toilet Tissue Holder and Dispenser, $7.99. Comes in Satin Nickel or Oil Rubbed Bronze and measures 6.49″ x 7″ x 23.8″. SOHL Furniture 3-Tier Bathroom Shelf, $9.99. Comes in Satin Nickel or Oil Rubbed Bronze and measures 36″ x 14.5″ x 11″. Easy Home Decorative Waste Bin or Toilet Brush, $8.99. Comes in Satin Nickel or Oil Rubbed Bronze. Waste Bin is 10.25″ x 8.25″ x 11.1″; Toilet Brush is 5.1″ x 5.1″ x 18″. Easy Home Shower Caddy, $9.99. Comes in Satin Nickel or Oil Rubbed Bronze. Measures 11.3″ x 4.5″ x 24″. Visage 3-in-1 Trimmer, $6.99. Includes beard and sideburn trimmer, nose/ear trimmer and eyebrow trimmer attachments. Read a review of a similar Visage product here. Huntington Home 20″ W x 34″ L Memory Foam Bath Mat, $9.99. Available in assorted styles and colors. Also available: 17″ W x 24″ L Memory Foam Bath Mat for $5.99. I own two of these bat mats, and they attract a lot of lint and dirt particles and are difficult to clean thoroughly. Read my review here. Huntington Home 35″ W x 66″ L Oversized Towel, $9.99. Boulder 3 oz. Bathroom Cups, $2.89 for a 200-pack. These come in seahorse or floral designs. Lacura Be Kissed Lip Balm, $1.89 for a 3-pack that includes cranberry, tangerine, and pomegranate flavors/scents. Lacura Body Lotion, $3.29 for 24 ounces. Varieties include Advanced Healing or Cocoa Butter. Lacura Body Lotion With Almond Oil and Vitamin E, $3.29 for 16.9 ounces. Cheese Club Premium Macaroni & Cheese, $0.69. Assorted varieties ranging from 5.5-7.25 ounces. Read a review here. USDA Choice Seasoned Stew Meat, $4.99 per lb. Beer Braised or Texas BBQ Braised. Family Pack Boneless Skinless Chicken Thighs, $1.69 per lb. Three-pound average weight. SimplyNature Organic 100% Grass Fed Chuck Roast, $7.99 per lb. Boulder, Cheese Club, Dentiguard, Easy Home, Huntington Home, Lacura, Simply Nature, SOHL Furniture, Visage, Welby. Bookmark.